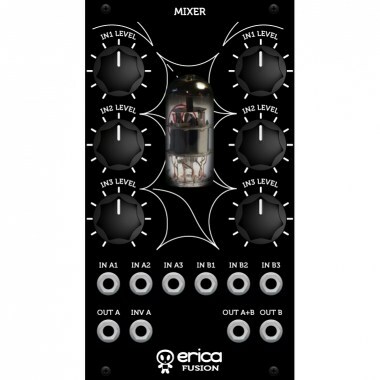 Erica Synths Fusion dual Mixer is designed to mix and overdrive audio signals on the vacuum tube. 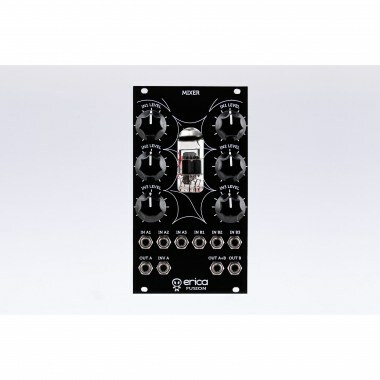 Eurorack модули Erica Synths Fusion Mixer V3 Вы можете купить по выгодной цене в наших музыкальных магазинах в Москве и Санкт-Петербурге, интернет-магазин, доставка по России. Use the Fusion Mixer as two independent 3-input mixers (also for stereo signal mixing) or a 6-input mixer. Special feature of the Fusion Mixer ﾖ great tube overdrive effects when level knobs are set to 3 oﾒclock or above. When used with drum machines, it even emulates sidechain compressors. When used to mix signals from VCOs Fusion Mixer it works as waveshaper, especially, if pulse width modulated pulse signals is used in one of inputs. Due to the fact that cold tube heaters have lower resistance, Fusion modules have significant power consumption peak at startup, when power consumption almost doubles for 1-2 seconds. This is not a problem with linear PSUs that have power inertia, but may cause switching PSU internal protection to turn off power supply. Please make sure your PSU has some headroom before installing multiple Fusion modules. If you need a 6 to 6 pin power cable included to your order (suitable for 6VAC PSU), please write that in the comment section during checkout process. Please, refer to the user manual below for all possible power supply configurations!